The National Math and Science initiative reports that the United States is losing its competitive edge in math and science while the rest of the world soars ahead. Our knowledge capital, which fuels innovation and economic growth, is at risk. Twenty-five years ago, the U.S. led the world in high school and college graduation rates. Today, the U.S. has dropped to 20th and 16th. Across the nation K-12 school districts are implementing Science Technology Engineering Arts Math (STEAM) programs to provide students opportunities to use content knowledge and skills in ways that are practical and applicable to the real world, just like they would if there working on science or engineering projects in the field. Research from the National Science Foundation suggests these STEAM programs are proving to be effective in increasing student interest and performance in math and science competencies among our students. I believe STEAM has made Jackson and Miranda more apt to think outside the box and has created an environment of increased engagement at school. It’s these activities that need to be invested in to encourage these subjects which will be critical to their success and development in the future. Foothills Academy College Preparatory is a public K-12 charter school with a mission to develop the whole child – their intellectual capacity, their collaborative ability with others, and their innovative spirit. As such, the Foothills Academy’s learning environment is weaving Science Technology Engineering Arts Math (STEAM) across the K-12 curriculum to yield more scientifically literate and science friendly graduates. The development of the Foothills Academy STEAM program is a response to research from the National Science Foundation which concludes that today’s learners need to be exposed to a “system of thinking” that nurtures a capacity to make both broad and deep connections across multiple disciplines. The Foothills Academy program leverages these findings by preparing students to engage in real world challenges and engaging activities from an early age. Students are given opportunities to collaborate and share discoveries on a global platform that enables them to become producers and not simply consumers of others experiences, discoveries, or inventions. 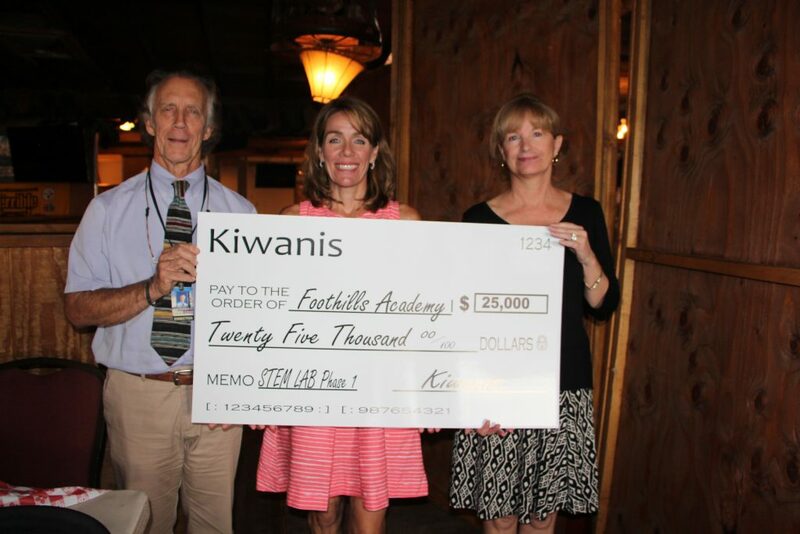 Thanks to a generous funding initiative from the Kiwanis Club of Carefree, Foothills Academy has expanded their STEAM program by building a state of the art STEAM Lab on their North Scottsdale Campus. This STEAM Lab is an addition to the K-6 STEAM Lab located in Cave Creek. Through the use of 3D printers, Keva planks, LittleBits, mechanics tools, virtual simulation, and bio engineering labs students are provided potential venues for advancing science and math literacies through the engineering and design process. Foothills Academy students are currently in the process of designing solutions to issues they believe can positively impact others such as: a “sound collar” for pets that would replace prong and electric shock collars; “automated soaping devices” to allow disabled parents to regain independence for showering; “LED touch straws” to light up bedside drinking glasses at night. The primary grades are equally engaged in design innovation through projects on water purification, electronics, robotics and learning to write code.